A summary of relevant new climate research and activities. 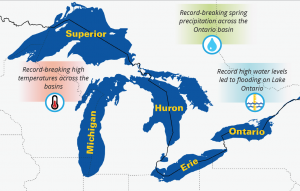 The Summary was developed as a pilot by the GLWQA Annex 9 Extended Subcommittee as a longer term trend analysis and compilation of the existing Great Lakes Quarterly Climate Summaries. It is intended for use by managers and practitioners at federal, state, provincial, regional, and local scales, as well as for stakeholders and the general public. As the 2017 Summary is a pilot, comments or suggestions for improvement can be submitted using the Contact Us page. This entry was posted in Climate Change Impacts (Annex 9), Documents by . Bookmark the permalink.